In 2013, H+K released a study on Communicating Character® that reinforces this concept. The study showed that consumers are increasingly looking for companies whose brand promise, reputation and behaviour are closely aligned. The research also demonstrated that consumers rely heavily on input from their peers to make decisions about which companies to do business with. 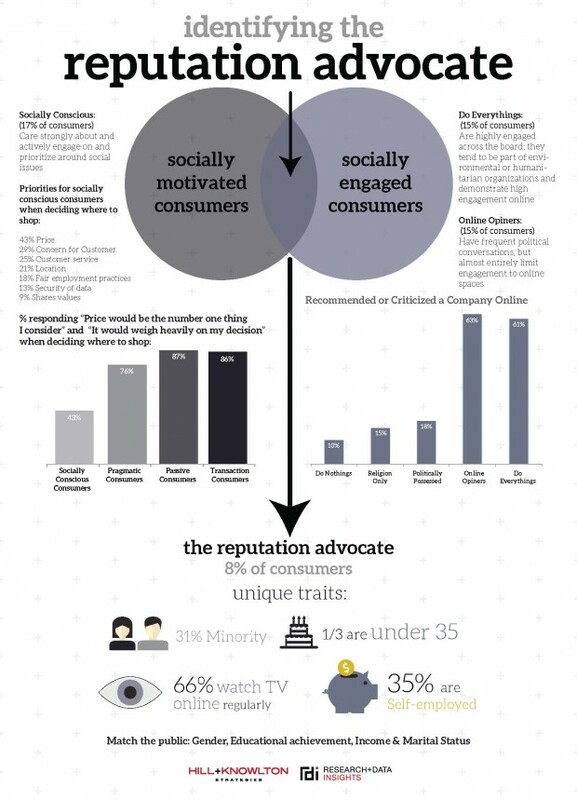 Now, a new study conducted by H+K Strategies’ research arm Research+Data Insights (RDI) reveals an opportunity for companies to communicate their character to consumers in an even more targeted way, demonstrating what companies are doing to deliver against their brand promise as it relates to CSR. Communicating Character® isn’t just about making a promise, delivering against that promise and then telling your stakeholders you’ve delivered. It’s a highly nuanced undertaking, and companies that are looking to communicate with character must take the time to learn about their customers and other key stakeholders and adjust their communications plans to achieve optimal positive impacts in customer perceptions.